To understand how to write a Lambda function, you have to understand what goes into one. A Lambda function has a few requirements. The first requirement you need to satisfy is to provide a handler. The handler is the entry point for the Lambda. A Lambda function accepts JSON-formatted input and will usually return the same. The second requirement is that you’ll need to specify the runtime environment for the Lambda. The runtime will usually correlate directly with the language you selected to write your function. The final requirement is a trigger. You can configure a Lambda invocation in response to an event, such as a new file uploaded to S3, a change in a DynamoDB table, or a similar AWS event. You can also configure the Lambda to respond to requests to AWS API Gateway, or based on a timer triggered by AWS Cloudwatch. You can even set up Lambda functions to respond to events generated by Alexa, but that’s well beyond the scope of this article. I use Java for the Lambda functions I write, and although I’ve noticed a slight lag if the function hasn’t been invoked for 10 or 15 minutes, I haven’t seen much of a performance difference. If performance and consistency are concerns, then you might want to check out this post comparing performance between Node.js, Java, C#, and Python. For the Lambda functions we’re going to create today, let’s do something a little more mathematical than a simple Hello World application. Let’s pass a couple of numbers into the function, and have it return the sum, product, difference, and quotient of the two numbers. The following examples assume that you have an account with AWS. If you don’t have one, you can sign up for a free trial which will allow you to experiment with each of the examples below. Since Python is a scripting language, you can create the script directly within the AWS console. 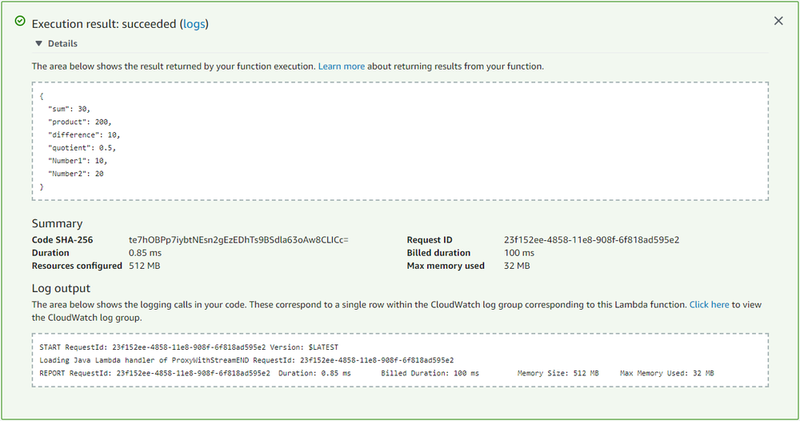 Log in to your AWS Account, and navigate to the Lambda console. Click on Create function. We’ll be creating a Lambda from scratch, so select the Author from scratch option. Enter an appropriate name for your Lambda function, select a Python runtime and define a role for your Lambda to use. Since we won’t be using any external resources, we don’t need special permissions, but this is where you would add a role with those permissions. Once everything is set, click on the Create function button. Let’s take a TDD approach to this. We’ll start by setting up a new test event. Click on the Select a test event drop-down and choose Configure test events. Amazon provides a significant collection of test templates. We’ll modify the Hello World template with data of our own. We’ll add a new event name and then click on Create to create the new test event. Once the test is created, we can trigger it with the Test button. The result is a successful execution, but we’re looking for a response other than “Hello from Lambda.” Let’s add some code to the Lambda to accomplish what we want. You can use the code below or use your python-foo to create something more elegant. Let’s see if we can duplicate this effort with Node.js instead of Python. Navigate back to the Lambda console, and click on the Functions page. Click on Create function. As before, we’ll be creating a Lambda from scratch, so select the Author from scratch option. Enter a new name, select a Node.js Runtime, and we can reuse the role we created for the Python-based Lambda. Node.js and Python are both scripting languages, so we can enter the code directly in the AWS console. Java is a little different, so while the test case approach will be the same with both of the examples above, we’re going to need to package our Lambda into a JAR and upload it to the console. The first thing we’re going to do is create a fat JAR of our Lambda code. You can download the code for this example from this GitHub repository and build it by running the following command from the root folder of the project. When those tasks complete, you’ll have a JAR file in the build/libs directory of your project. Once you have the JAR, we can go about creating the Lambda and uploading the JAR. Similar to the examples above, we’ll begin by navigating back to the Lambda console and selecting the Functions page. Click on Create function. 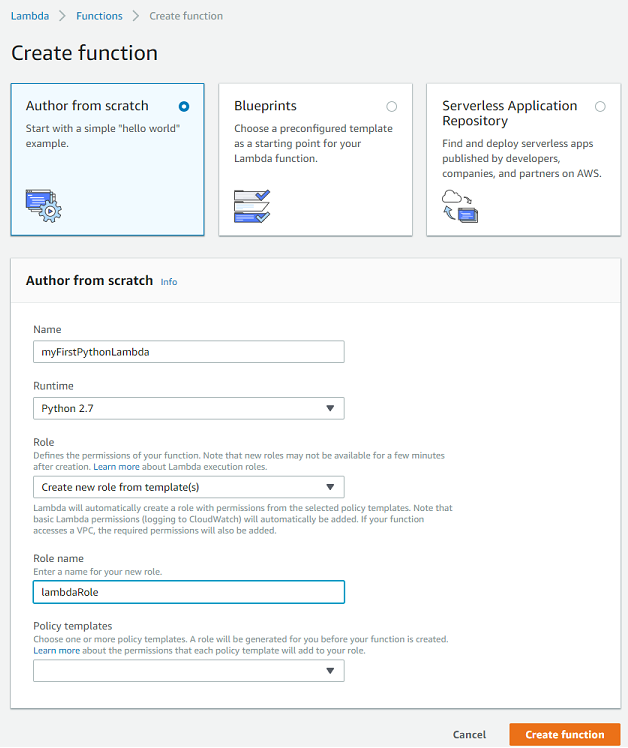 Ensure you’re creating a Lambda from scratch by selecting the Author from scratch option. Enter a new name, select the Java 8 Runtime, and we can reuse the role we created for the Python-based Lambda. Once we’ve created the Lambda, we need to upload the JAR to it. Select Upload a .ZIP or JAR file from the Code entry type drop-down, and then click on Upload. Navigate to the build/libs directory of your project and select the created JAR. You’ll have two files to choose from. Ensure you select the file with -all.jar at the end of the filename. Once you have the JAR selected and the handler configured, click on the Save button to upload and finish creating your Java Lambda. We can use the same test approach as we used from both the examples above, so scroll back up the Python section and create a test for the Lambda. Once you click on the Test button, you should see a result similar to the one shown below. As I mentioned back in the beginning, there are a plethora of ways to invoke Lambda functions: from S3 events, to Alexa triggers, to on demand triggers using AWS SDKs. For more information, I recommend checking out Amazon excellent documentation on how to do this.